For our Hands On 1-on-1 Surgical Training, we will help you obtain a temporary Ohio Dental License if required. Dr. Alfred “Duke” Heller, founder of the Midwest Implant Institute, limits his practice to the placement of dental implants, and has placed more than 20,000 implants since 1969. He received both his DDS (1962) and MS (1974) from Ohio State University. He is a fellow of the American Academy of Implant Dentistry, is Board Certified in Oral Implantology and is past president of the American Board of Oral Implantology. Dr, Heller is also on the staff at Grady Memorial Hospital. Dr. Robert Heller is a graduate of Ohio Wesleyan University and the Ohio State University College of Dentistry (1988). He completed a Prosthetic residency at Medical College of Virginia (1990) and a hospital based implant residency at Loma Linda University Dental School (1997) He served as President of the Ohio Section of the American College of Prosthodontics and Chairman for the Ohio Dental Association’s Subcouncil on Young dentists. Dr. “Rob” is a teaching faculty member of the Midwest Implant Institute since 1995, and director of the prosthetic arm of the institute. Dr. Kim Laurell is a 1976 graduate of the Ohio State University College of Dentistry and received a Master of Science in Prosthodontics 1986. He was a full-time faculty member at OSU for 20 years and coordinated the fixed prosthodontic portion of the Advanced Prosthodontic Residency Program. He maintains a Prosthodontic practice geared toward aesthetic dentistry, full mouth rehabilitation using fixed, removable and implant prosthodontics and the treatment of Temporomandibular disorders. Dr. Russell Kiser is a graduate of The Ohio State University College of Dentistry (1999, DDS). Subsequently, training at a general practice residency (GPR) at St. Luke’s/St. Vincent’s Charity Hospital in Cleveland, Ohio was completed (2000). Then, specialty training in Endodontics and a masters thesis was completed at The Ohio State University (2002, MS). Since then, he completed implant training at The Midwest Implant Institute in Columbus, Ohio (2006). Currently, he maintains a private practice and is on faculty at The Midwest Implant Institute. Vickie McCune started in dentistry in 1978, as a dental assistant. She has been teaching, her true love, for 15 years. Anyone who has taken her courses remembers with fun and laughter how to do ‘Sterile Protocol Technique’ and ‘Surgical Assisting’ for Implant Dentistry. Introductory course designed for Endodontists wanting to pursue implant training. Go to www.midwestimplantinstitute.org for course description. Even if you don’t do surgery, learn how to restore so you keep your patient in your practice. Teaches the different basic concepts and the types of prosthetics components from different implant systems. How and when to graft (and when not to). Types of graft materials, use of PRP and other adjuncts. Bring your own patients for hands on surgery. Sinus grafting, block bone grafts, on-lay bone grafting procedures. 4 Sessions with appointment times arranged according to your schedule. Same as 551 but participant Doctor/staff perform surgery on their patients under institute faculty supervision and guidance. To accommodate scheduling problems, doctors can sign up for any 301 Course, and then sign up for the appropriate implant system specific 302 Course they desire. Courses 551 and 552 run throughout the year with dates and times arranged for mutual convenience of all involved. (can also be paid as 4 monthly payments of $3250 or 6 monthly payments of $2200). External finance opportunities available. You can also download the full brochure for a printable version of this information. 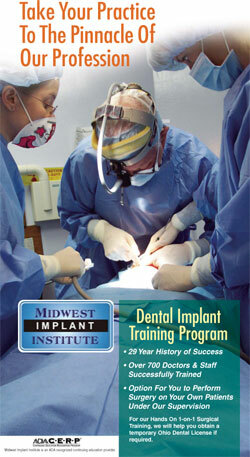 If you must cancel your registration, please notify the Midwest Implant Institute immediately. Cancellations made more than 14 days prior to the start of a course are subject to an administration fee of $50. Within 7-14 days a 50% refund will be paid; Within 7 days a 25% refund will be paid. Please allow 4-6 weeks for refunds. “No shows” will not qualify for a refund. If you no longer want to receive emails from Midwest Implant Institute Fellows, please unsubscribe here. This entry was posted by Dental Continuing Education on February 2, 2009 at 2:30 pm under Implant Surgery. You can leave a response, or trackback from your own site. Follow any responses to this entry through the RSS 2.0 feed.